Apostle Afolayan was born on the 4th of march 1964 in Ikosu-Ekiti in Moba Local Government Area of Ekiti State. He started his educational carreer both primary and secondary in the same Ikosu- Ekiti befor he proceeded to All Saint Teachers College in Usi- Ekiti. He worked as a clerk between 1985-1987 at the Nigerian Stored Products Research Institute,yaba Lagos. He resigned from there and established his own school, Hope kiddies college and coaching centre, odiolowo Mushin Lagos. He had a personal encounter with God in 1985 and has since been preaching and teaching the Gospel with the mandate to set captives free and empower them to fulfill their mission in life. A seasoned speaker at church crusades, revivals, conferences and seminars. He is also the host of the Holy Ghost theatre, Irreversible solution hour, both a monthly healing, deliverance and prayer services where the spirit of God is believed to manifest through healing and deliverance. Apostle Gbenga also preached and ministered at the lunch hour fellowship organised for Industrial workers, this was a turning point for workers in the judiciary, banks, oil companies and other corporate bodies. The man of God had an encounter with Armed Robbers in dec 1991 where he would have ended his life but THE God Almighty which he serves and believes in saw him through. He resigned from all his businesses and thus became a full time preacher. He was subsequently ordained Associate pastor of Life Foundation Chapel, Akoka, Lagos in 1992. Here, he ministered with the gift of the holy spirit which led to the miracles, healing, deliverances, and blessings at the church conventions and crusades. Apostle Gbenga resigned in march 1996 from Life Foundation Chapel and waited on the Lord for direction on his life mission. During these period, he served in the International Network of Prophetic Voices(INOPROV) for a year under Rev Sam Aiyedogbon. He was also with the Redeemed Christian Church Of God. The man of God founded his own ministry, (HVCIM) IN 1998. He is fully involved in the propagation of the Gospel and Edification of the body of Christ. Pastor Gbenga's life and ministry is daily characterized by giving, he is a philanthropist who has put smiles on the faces of many families. His ministry has been growing from leaps and bounds, this is evidenced in the number of branches which the ministry has established. Irreversible solution. And many more. 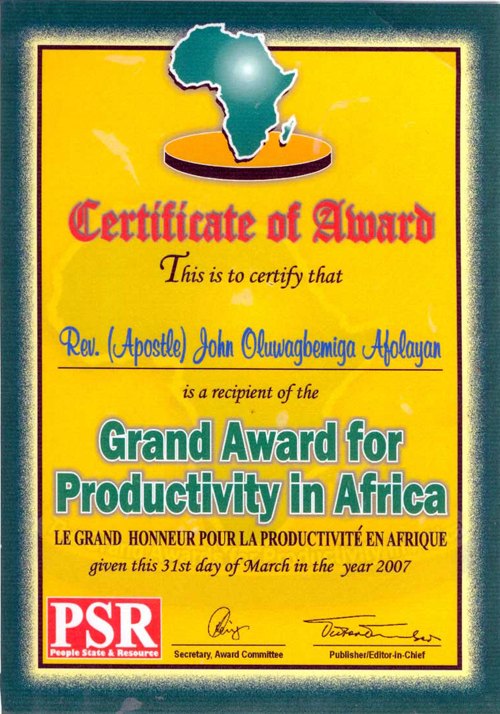 Grand Award for Productivity in Africa(GAPA) 2007. NBGP (Listed in the Nigeria Book of Great People 2007 by People, State & Resource magazine). Meritorious Awards in Rescurer School of Theology 15th Dec 2006. 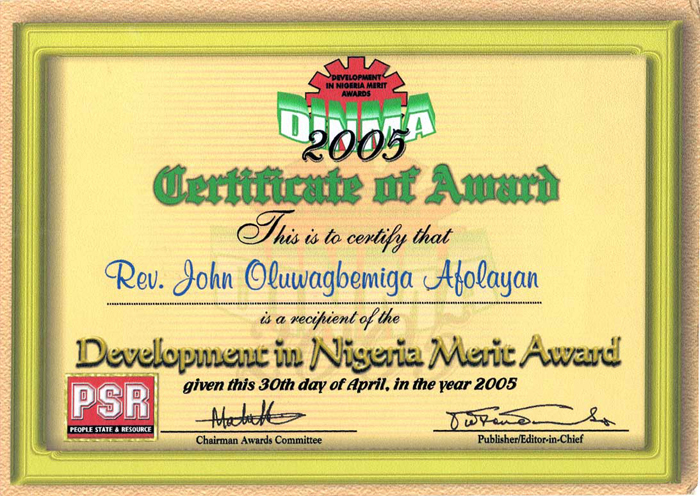 Development of Nigeria merit Award (DINMA 2005) the P.S.R awards are among the biggest in the country. Apostle Afolayan is married to Pastor (Mrs.) Ngozi Afolayan and they are blessed with five(5) children.